Anyone that enjoys the outdoors knows the importance of lending a helping hand to expose people to the world around them. Both of us, along with several of our buddies, had the opportunity to assist Vermont Fish & Wildlife at their “Free Ice Fishing Day” kids clinic that was held at Lake Elmore. We were excited for the opportunity and were on the ice around daylight to help set up for the event. 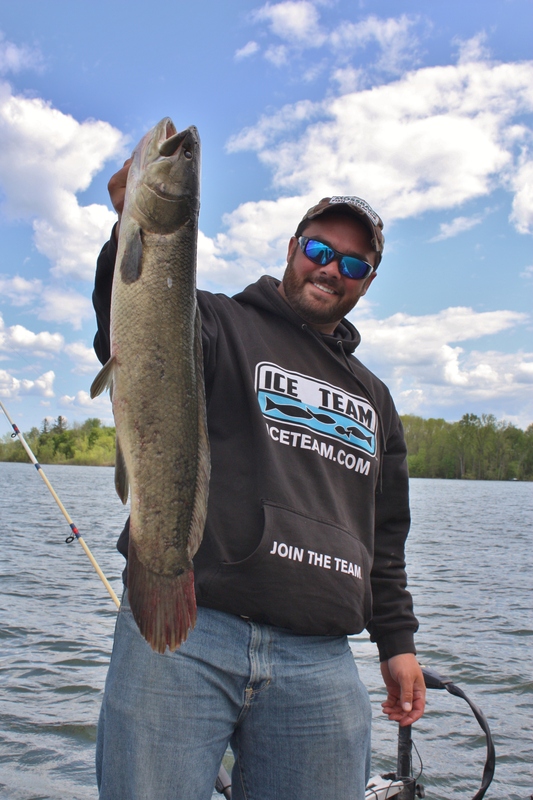 After setting up numerous stations, we got the augers running and began punching holes for the jigging and tip up demos. As the 10am start time approached, everyone involved put the finishing touches on their stations and we all got a rundown on how things were expected to work. Our station took a while for much traffic to show up as the anglers needed to visit several stations before grabbing a rod to attempt to catch their own fish. Once people started coming, it took a little over 4 hours before things began to slow down! One of the most best parts of the day was seeing that even though it was a kids clinic, many adults were were just as involved with trying to learn how to fish. We had groups from as far as Connecticut come for the experience! As for the quality of fishing, it was tough catching fish that were big enough to cook up at the fish frying station. 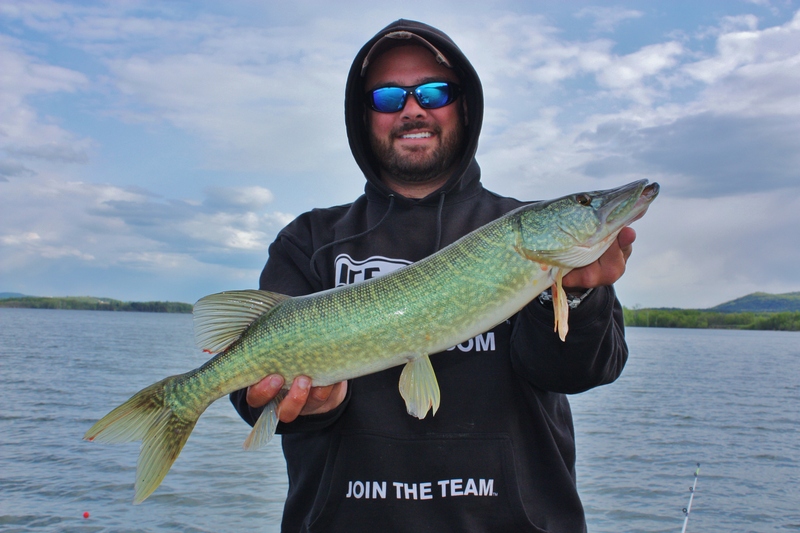 We only caught a few keeper perch and one pike all day. 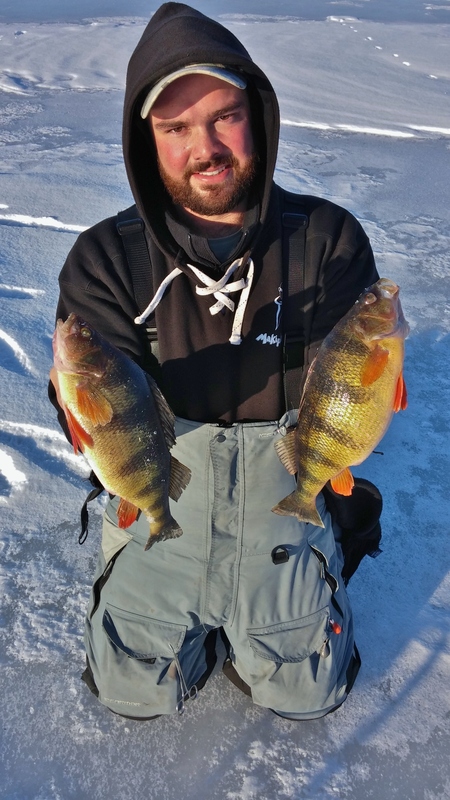 Fortunately, the numbers of smaller perch were very high and most participants were able to catch at least a fish or two. 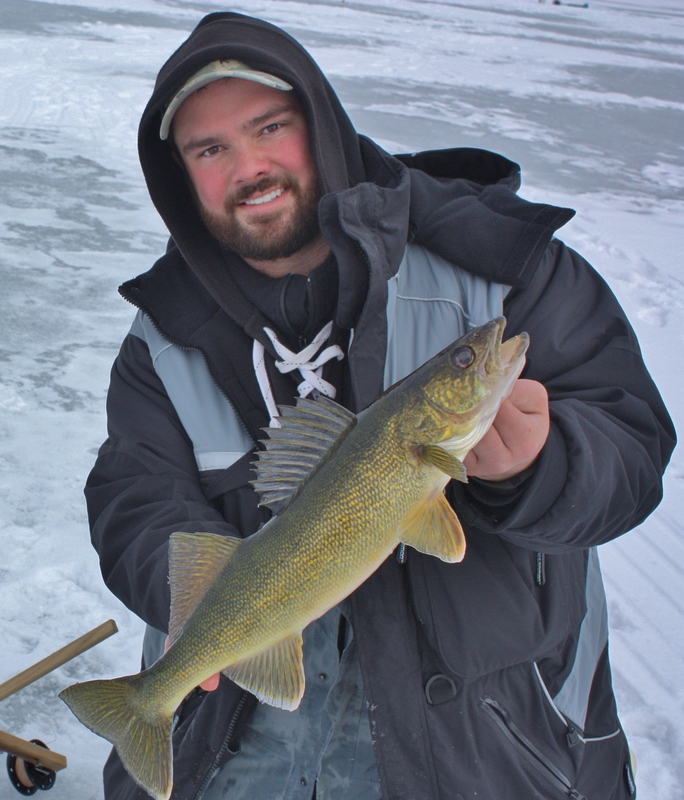 Weather-wise, it was a beautiful day and being part of a well run ice fishing event made us feel very fortunate. We can’t wait to help with future events! I ventured out with a buddy well before daylight today. We set up base camp in a saddle between two humps and began placing tip ups along various contours on both sides. Our depths ranged from 14 out to nearly 30 and as the sun rose we were surprised that the flags weren’t flying. It wasn’t until nearly 7:30 that we got our first flag, and walleye. After putting it back, another flag popped on the other end of our spread. Sled in tow we made our way over and pulled in another walleye within only minutes of the first. With two fish caught and released, we had high hopes that the rest of the day would follow suit. While waiting for flags, we set up a two man flip over shack on one side of the hump trying to jig up perch, bass, walleye, or whatever else might swim by. The jig bite was slow but we stayed plenty busy chasing flags from end to end. Mostly the action was run and drops so we figured the perch were moving through in small schools. However, the perch that we were catching were tanks! As the day passed, we cooked up a meal of venison sausage for a lunch. The fish were nice and allowed us to eat in peace with no action. After filling our bellies, another slug of perch came through not giving us time to settle and digest. Could be worse though! As the daylight started to fade, we checked all of our traps to make sure that we were squared away for a successful evening bite. Again we had a back to back walleye episode as well as several more perch. The night was concluded with an after dark, sure bet on walleye flag that turned out to be a rockbass. After the bite abruptly ended, we decided to pack it up and make for home. 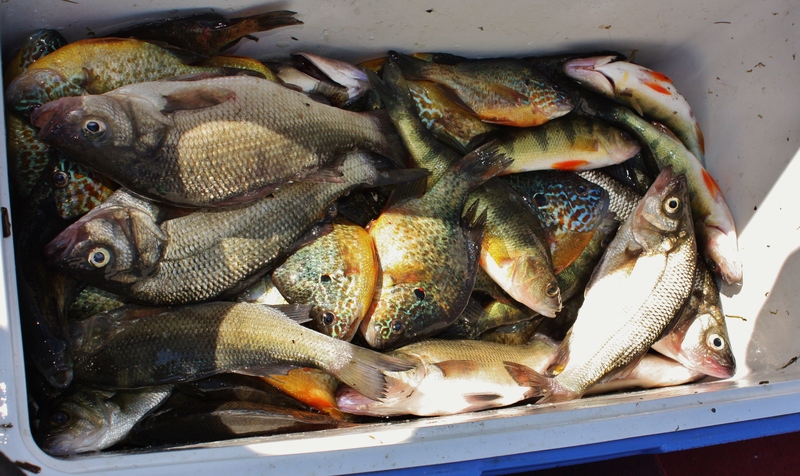 We ended the day with 8 or 9 walleye, a bunch of smallmouth, and a couple meals of perch. 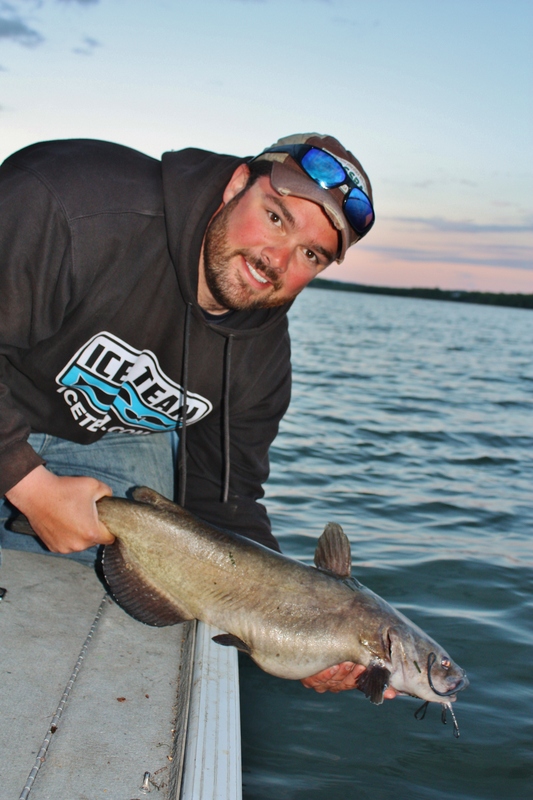 So we have written about deep water perch plenty before but this trip was special. It was my first trip out on this pond in several months and I didn’t have an idea of where to start. Unsure of ice conditions and in search of some marks on my flasher, I hit the ice well before day light to see what the ice looked like. I was alone but knew the layout of the water well so I wasn’t worried about the depth. I knew shortly that things were good so I made my way out. I placed my second hole of the day in 32 feet of water and sunk my Vexilar transducer. It was flashing one nice mark just off bottom. Still around 25 minutes before dark, I dropped my set up down. Within seconds I was hooked up. 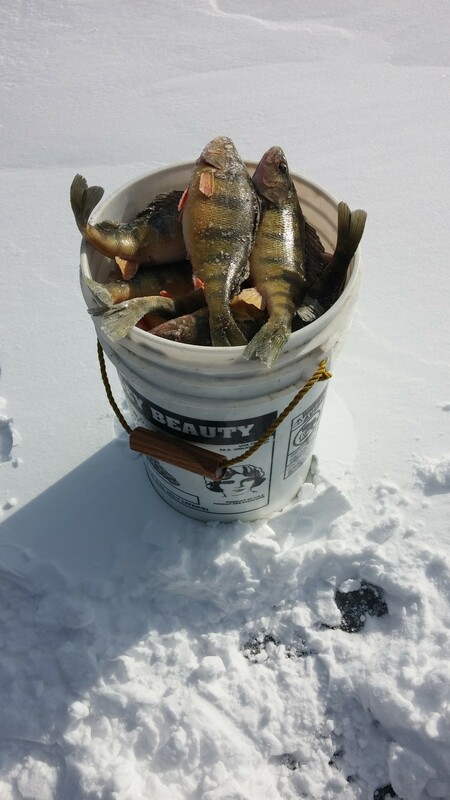 Over the next half hour I pulled 23 perch over a pound out of one hole. After those 23 things seemed different though. I was seeing more and smaller marks. 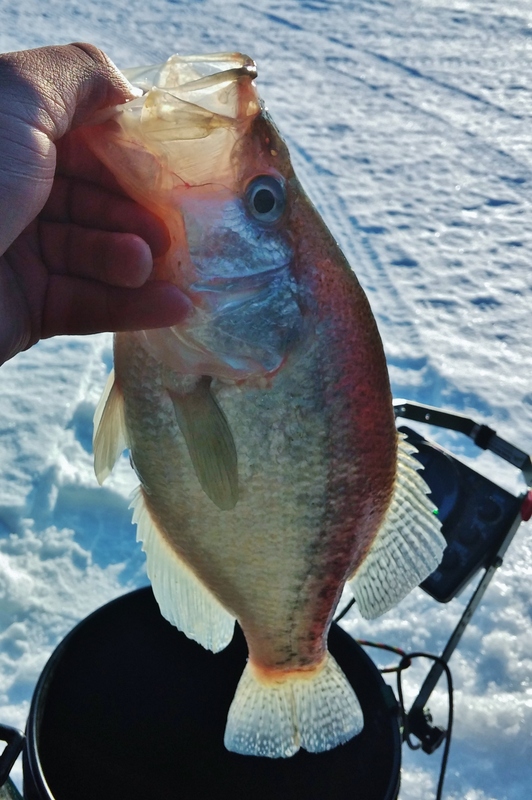 They were much more aggressive and after catching a few small ones I cut a new batch of holes around my starting point to find their direction. For the next hour I could catch one or two slabs out of a single hole before the small ones invaded. With my clicker on 40, I struggled to get the remaining 10 fish to complete my limit over the course of 3 hours. At 11, I packed things up with my bucket topped off. I figured with 50 big perch to clean it was time to head home and start cleaning them! 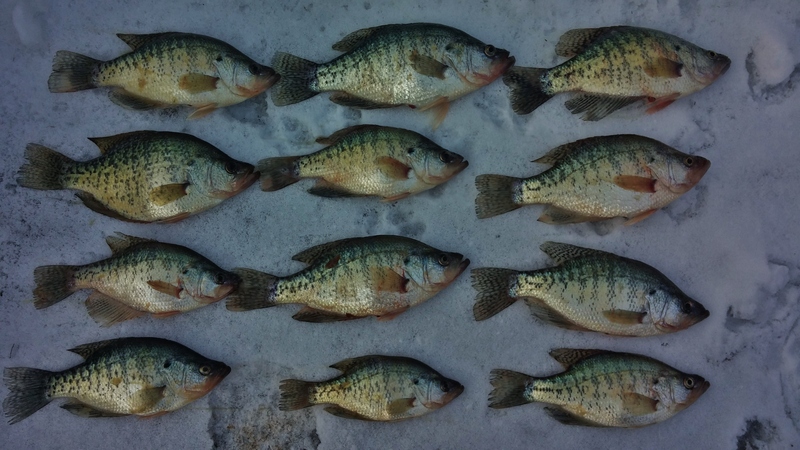 The cold in the air kept us moving in search of the nomadic pods of white crappie. The bite didn’t start early like we had hoped but the quality made up for it. 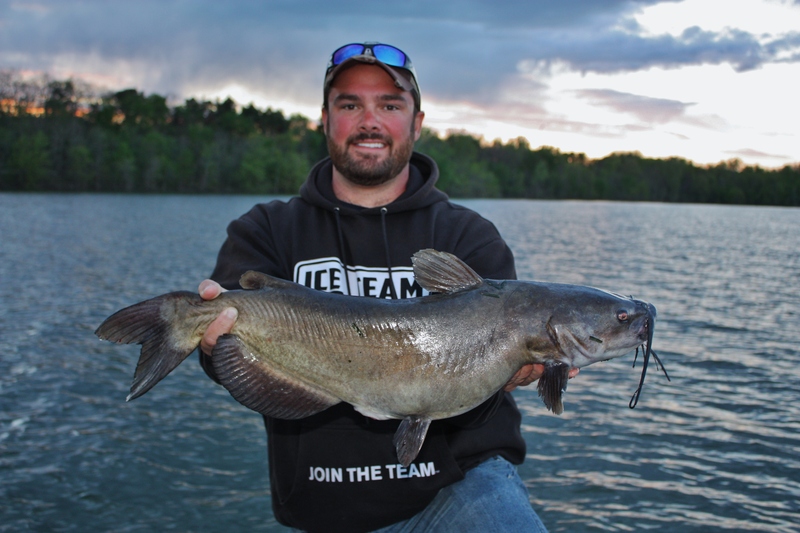 The first fish up the hole was just shy of 15″. Not too bad! As we covered more and more water, the bite stayed slow but we picked at fish as we moved. 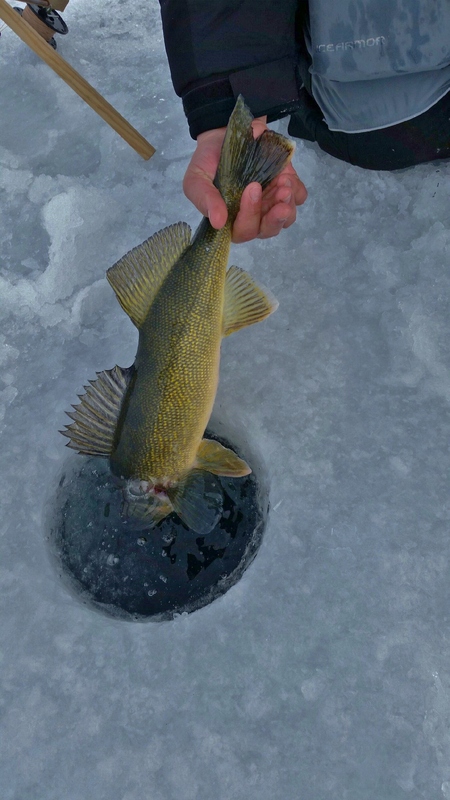 At times, we would get into small pockets of fish but never any big runs. After covering about a mile of water, we stumbled upon an area about 50 yards in wide that was holding a decent number of quality fish. They seemed to be working back and forth across a few holes that we had punched. The hours were passing and we were content with the fish we had put in our buckets. What sounded better than continuing to fish? 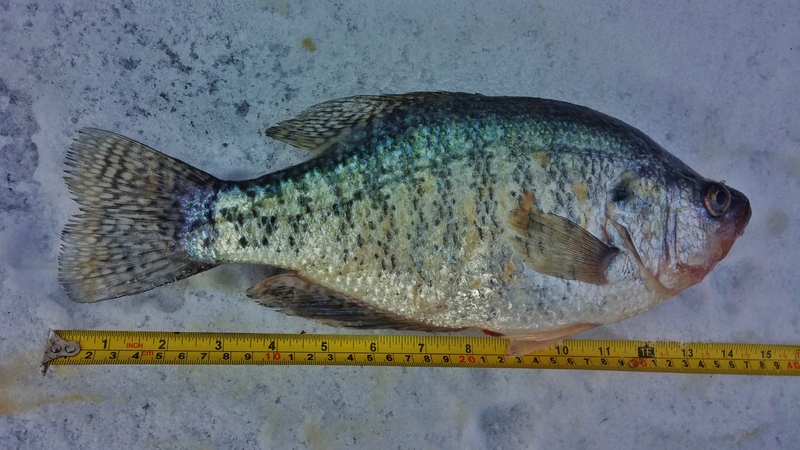 Maybe crappie for lunch! We had a bag of fillets from the night before so we headed home to fry them up. After chowing, I headed for home to clean some more fish for another day later in the week! To start off a several day fishing spree, I met up with a buddy and his wife to fish for some panfish on Lake Champlain. 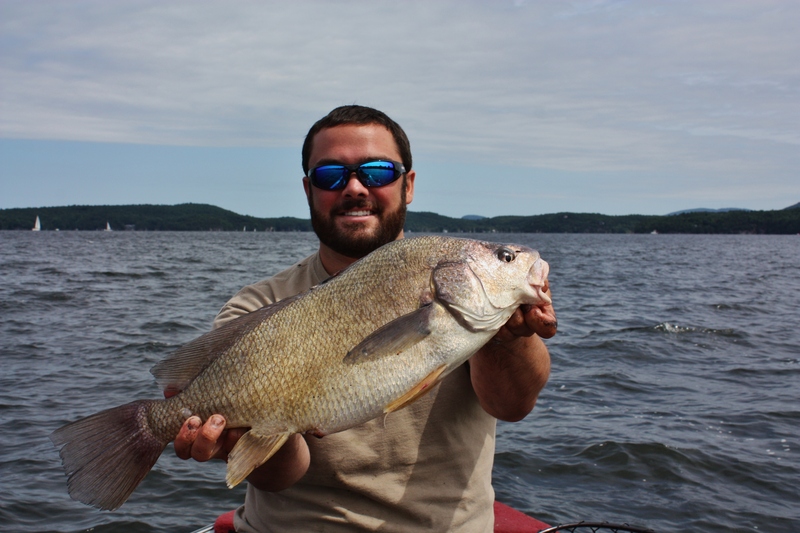 The main target for the day was to be white perch but in the same area would be yellow perch, pumpkinseed, bluegill, and most likely every other fish Lake Champlain has. The weather was suppose to finally cool down after a two week heat wave and I couldn’t be happier. We were on the water shortly after 7 and it was starting off as a great day. There was a slight chop on the water and the fish bit right off. Before the anchor was even set we had some fish in the boat. We used the anchors long rope to change our fishing spot for as long as the fish bit. When the bite would slow we would flag out further until we got on them again. 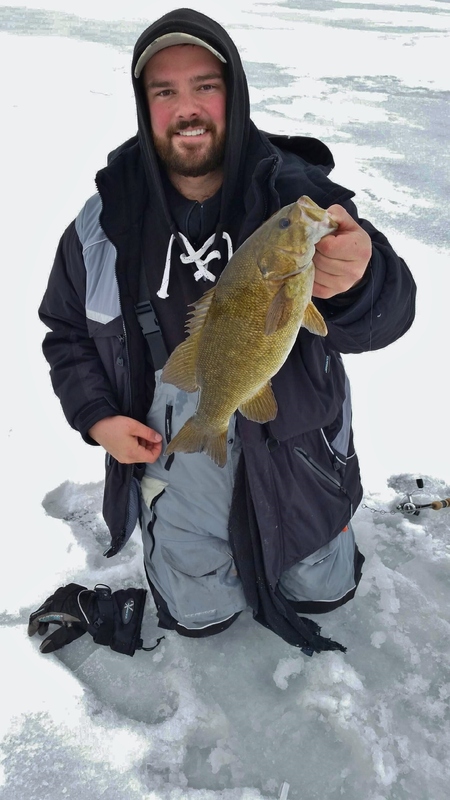 The majority of the day was vertical jigging with a 1/8 ounce jig on the bottom and a hook tied in line a foot or two above. As the sun rose higher in the sky, I used a drop shot rig to hold the bottom thinking that the fish would move down the water column to stay in the cooler water. Not to mention, as it got later, more boats came out and the water became rough making it tough to feel bites with little to no weight. The fishing was either really good or really bad and it became apparent very quick when we needed to move. It seemed like throughout the day, the larger fish were holding tight to the deep side of a weed edge while the smaller ones were in the weeds. Using electronics was huge in order to locate the weeds when they weren’t visible. The majority of the day was spent in 11-16 feet of water. 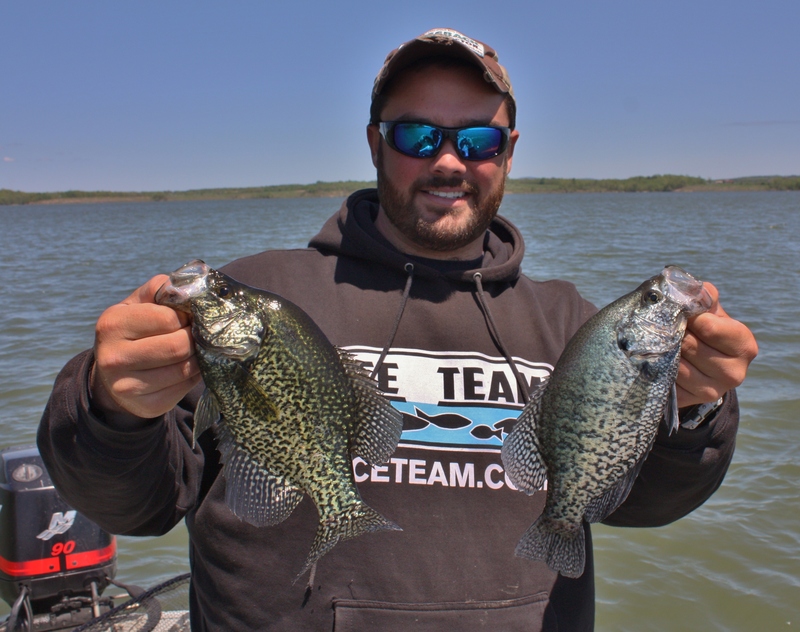 While most of the fish were holding close to the bottom, the white perch were anywhere from 7-9′ below the surface. 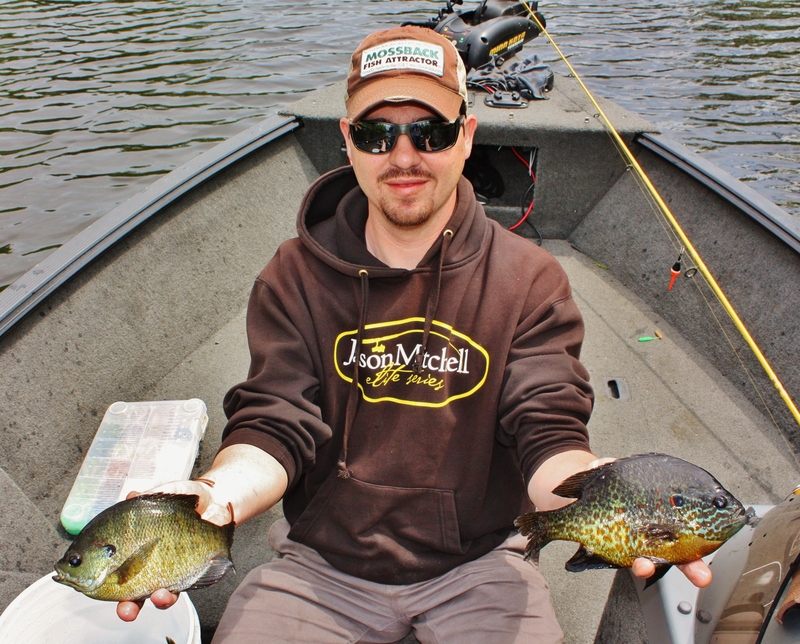 Mixed in with the panfish we were after were several nice bass, bullpout, and drum.